A dementia cafe has received a cash boost from a financial institution. The cafe at St Richard’s Church Hall in Haywards Heath was recently presented with a cheque from ABN AMRO Finance. 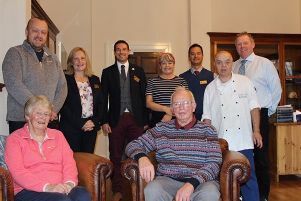 The donation of £3,800 from the Haywards Heath business has been given to support the Know Dementia cafe, which provides assistance to people who have been diagnosed with dementia. Know Dementia, is a charity which is run by volunteers comprising family carers and qualified professionals who live and work with people with a dementia. The services they provide include: telephone support, visits to your home, and time to talk, social activities. The meetings give members opportunities to meet others in the same position. The cafe at St Richard’s provides a safe place which is informal and friendly and volunteers are on hand to give advice on finance and care provision as well as training on how to cope with the diagnosis. The monthly cafe meetings come with tea and coffee, homemade cakes, a little fun and laughter with various types of entertainment, activities, games, and music. The cafes are free to attend. Volunteers at Know Dementia have trying to set up a dementia-friendly community with a wider knowledge of the condition. The next two cafe meetings are on December 18 and January 5 and the staff will be ready to welcome people with memory problems and their carers or family supporters.